CURRENTLY OUT OF STOCK. 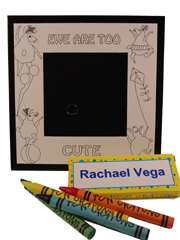 EWE ARE TOO CUTE is the theme of this adorable coloring frame. It comes with crayons in a specially designed box and is sold ONLY in sets of four. Approx 5 1/2 x 5 1/2 inches.